Sometimes happiness is elusive. Most of life is about routine, the everyday jobs we have to do, our obligations and responsibilities. Driving to work every morning, paying the bills, feeding the kids. There are few bright bursts of joy, in ordinary life. It’s the little things in life that make it worth living – easing an aching body into a hot tub, a cold beer after a stressful day, the amazing freedom of arcing over the waves on a surfboard, a warm dry house in a rain storm. Do you like me wonder about the secret to contentment? Do you know the astonishing ingredient all of these have in common? Polyurethane… Its uses and applications are endless. How could we ever cope without it? And the list is endless, a vital ingredient in everyone’s day. Recently Jonassen Industrial Projects Limited played its own small role in your happiness. JIPL was asked by Era Polymers to design, build and commission a new insulated hotbox-type batch oven for its Takanini, Auckland branch. Era Polymers turned to JIPL because they wanted a reliable, energy efficient, and maintenance free batch oven that will handle even the busiest of times. Era Polymers NZ specialises in the field of polyurethane chemistry. It has a state-of-the-art manufacturing facility, as well as advanced quality control laboratories, to ensure all products produced are to a very high standard. The production facilities focus on the manufacture of polyurethane foams and prepolymers. Era Polymers NZ operates under the ownership of Era Polymers Australia, which is one of the largest independent polyurethane systems in the world. This connection brings a vast array of other products to Era Polymers NZ, ranging from high-performance polyurethane elastomers, timber and concrete floor coatings, spray polyureas, to moisture cured adhesives and binders. The existing oven at Era Polymers NZ couldn’t cope with the increasing demand for their products. The Takanini branch imports some of its products from the parent company and / or mixes some chemicals here in NZ from bulk materials supplied from Australia. The ingredients are shipped and stored in 205-litre drums. During storage, the contents can become wax-like in texture. Prior to being opened, decanted and mixed these need to be warmed up to turn them back into liquid. Era Polymer’s existing oven could only take two drums at a time. 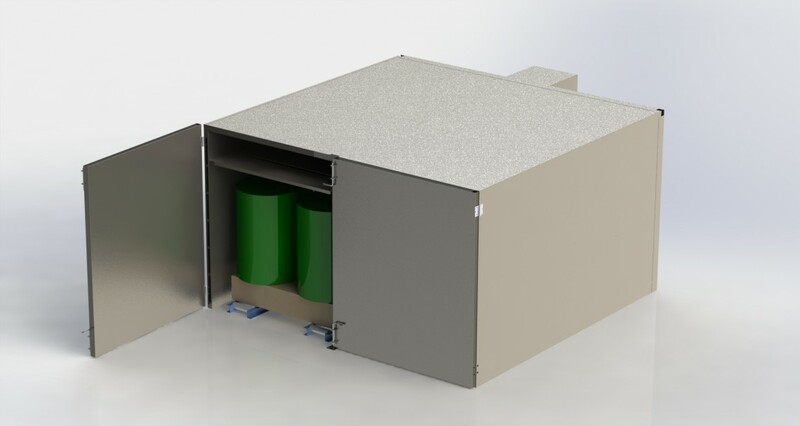 Era Polymers have also developed a new product, manufactured in NZ in large volumes, so they needed a larger heater box to warm more drums and speed up production. Era Polymers wanted a dependable, energy efficient, and maintenance free batch oven that will handle even the busiest of times. They didn’t want the oven to be the bottleneck of the production. JIPL designed, built, installed and commission a highly efficient, insulated hotbox-type batch oven that takes 16 drums at a time without the need to take the drums off the pallets. Now it is simply a matter of picking up the pallets of drums (4 drums per pallet), lowering them onto the roller bed, pushing them into the oven, closing the door, setting the temperature, and pressing start. As usual with JIPL designs, multiple safety systems were integrated into the oven, such as the dual over temperature controller, and fan run-on controller to prevent the possibility of overheating or burning out of the heating elements. JIPL’s engineers designed and produced drawings to manufacture the precision sheet metal for the assembly of the oven. JIPL’s skilled, competent team built the oven on-site and commissioned the oven for immediate operation. JIPL’s professionally project managed the project from concept and development through to procurement and commissioning to ensure that every client need was met. Era Polymers turned to JIPL because it prides itself on its enviable reputation for outstanding product quality and customer service. Jonassen Industrial Products Limited is proud to have had the opportunity in assisting and working with Era Polymers and also in contributing its own small measure to your happiness. Contact Chris or Blair to let us help you.